This document describes the modifications performed on N1918Q and is not an official document of Airdrome Aeroplanes. The material is only intended to provide an overview of the modifications performed on N1918Q and may not be applicable to other aircraft of similar type. Phase One for an experimental aircraft is often relegated to 'burning off hours' because the builder isn't interested in a rigorous test phase or the aircraft is very well-mannered. But occasionally Phase One will unmask an aircraft with flaws serious enough to warrant immediate attention. Such was the case with N1918Q. Within ten seconds of lifting off the runway on the first takeoff I knew my plane had a major problem. Regardless of airspeed it was necessary to hold a large amount of forward pressure on the control stick to prevent the D.VII from rearing up into an aggressive climb. Something was seriously out of whack. The plane had been carefully weighed on calibrated scales and the CG was located at the forward end of the recommended range. The engine mount was fabricated with zero vertical and lateral thrust, and all flying surfaces were straight and square and set up per plans. But something was making this Fokker want to climb straight up. Otherwise, the plane flew quite nicely, aileron response was crisp, and landings felt like they were at walking speed. A conversation with Robert Baslee, designer of the Airdrome Aeroplanes D.VII, brought suggestions to shim the horizontal stab a small amount and reflex the ailerons a bit up in order to inhibit lift. But these changes had no effect. I then cranked the horizontal stab up as much as possible (+1.5*) and added 1.9* down thrust to the engine mount. The aggressive climb tendency was still present. I next attached a huge and ugly trim wedge to the elevator but the insistent climb persisted. The plane could not be trimmed for level flight. Now what do we do? I began researching old biplane technical papers and an odd item popped up. Most biplanes have wings with less than 1.5* incidence from neutral, sometimes positive, other times negative. But the Fokker plans clearly called for +2.5* for both wings. It became obvious the plane had too much positive incidence which made the landings very docile but was creating the aggressive climb behavior. However, Mr. Baslee insisted +2.5* is how his prototype was set up and it flew "hands off". In an act of desperation and an attempt to shake loose information from the fleet, I posted videos of my test flights on the Airdrome Aeroplane email list showing the constant down elevator required to hold the D.VII level at all speeds. Some poking around revealed that all of the customer-built Fokker D.VII aircraft initially had flight characteristics similar to mine. Various mods had been performed in an attempt to tame the beast including adding large amounts of engine down thrust and jacking up the leading edge of the horizontal stab to an extreme. But calls to Baslee from builders had resulted in an insistence that +2.5* was the correct wing incidence. A few days later I received a remarkable call from Robert. In a very apologetic manner he admitted he had made a major error with the drawings. Another look at his prototype revealed that, yes, it had 2.5* wing incidence, but it was negative 2.5 degrees! The reason his plane was flying smoothly was the 2.5* difference in incidence between wings and horiz stab. A plane built to plans had 2.5* difference in the other direction, a huge error of 5 degrees. No wonder the poor Fokker was clawing for the clouds...downwash from the top wing was pushing the tail down beyond its ability to maintain stable level flight. Robert stated he wanted to make this situation right with builders and offered to assist with labor and/or parts to rebuild planes to the proper wing setup. Since transport of the plane to Missouri was impractical, and I was in the middle of flight testing and had demonstrated some degree of aptitude in rapid construction and objective test flying he requested assistance in formulating a set of corrections for the D.VII fleet. Because my plane was completely unsuited for flight as it was, I agreed to help any way possible. We decided the first step would be modification of wing cabanes and N-struts to bring wing incidence to 0.0*. The goal was to squelch the aggressive climb so the plane could be trimmed normally. The plan agreed upon involved raising the trailing edges of both wings to bring the spars to 0.0*. 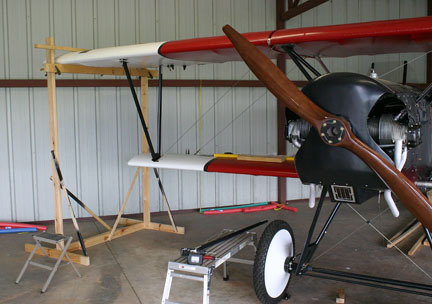 Re-rigging a biplane is a huge job, especially for a plane with non-adjustable struts, and one already covered and painted. This would basically involve taking the plane apart and building it again. 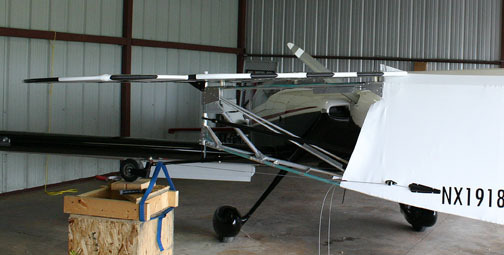 The bottom wing rear spar carry-through was difficult to drill while building a naked airframe, relocating it in a covered fuselage was indeed daunting. The interior of the cockpit was stripped, fuselage side panels removed, all wings hung on the hangar wall, and the process of rebuilding N1918Q was begun. Little did I know re-rigging the wings was only the first chapter of a long, tedious process. Note: This is 0.0* spar center-to-spar center. The front spar is 2" in diameter, the rear is 1.5". If using a level to establish 0.0* it is necessary to put a 1/4" shim between the level and rear spar to account for the smaller diameter of the rear spar. These angles can be determined with careful attention to a high-quality bubble level but a digital level makes this job easier and more precise. Note: All dimensions and angles in this document are what was used on N1918Q. Variations are certain to exist in different examples of the D.VII so the builder must be careful to take into account these differences. The major variation can be in regard to rib construction. The rear spars are centered between upper and lower rib tubes on my plane and Robert's prototype, but if ribs have been constructed with different spacing this must be taken into account when setting wing incidence angles. Note: The aircraft must be leveled to the greatest precision possible for the following modifications. 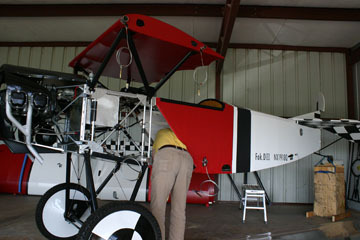 Level across the top longerons in the cockpit and shim up the landing gear as necessary to establish side-to-side level. Level the top longerons lengthwise and jack up the tailwheel as necessary to establish perfect level. Try to lock the plane into position best you can because all incidence angles will be referenced off the level longerons. This step cannot be over emphasized. Once you have everything level....check it again. Note: Raising the rear spar is the "ultimate" solution to re-rigging the plane because the original lift and landing cables can be reused. However, access to this area of the fuse may be near impossible in some cases without removing fabric (or if the builder is bubba-sized). 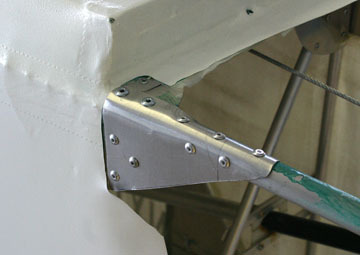 Robert Baslee has developed a weldment that raises the lower wing rear spars with the carry through in the original location. This option will require new rear lift and landing wires which is not a major hurdle. But I elected to raise the carry through instead of using the weldment because I could access the carry through structure in the fuselage. 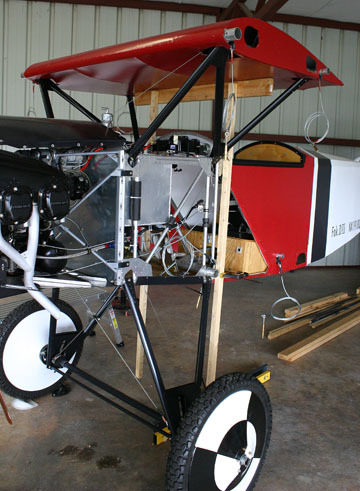 Installing the rear spar carry through is the most daunting step in D.VII construction. This establishes wing incidence which must be matched in the upper center section, and the location of this part makes it difficult to align and drill. This is with an airframe that is uncovered. Performing this operation in a covered aircraft compounds this difficulty immensely. I was able to strip the fuselage of removable panels and interior components so I could with great difficulty wriggle my upper body into the rear portion of the cockpit to access the carry through attachments. Removing the carry through isn't the problem, redrilling new locating holes is where your patience is severely tested. Below are the steps I used in this crucial modification. 1) Verified the wing incidence as originally constructed. It will be close to +2.5* if built per plans. 2) Used the level to determine how much the rear spar must be raised to achieve 0.0*. The 1/4" shim on the rear spar is essential for an accurate measurement! In my case the spar was raised 1.375". 3) Removed the carry-through structure taking note of any shims or washers used for spar-to-spar spacing. 4) Marked the fuselage tubes to locate the new carry through bolt holes. Care was taken to assure the carry through remained level side-to-side and centered on the fuselage center line the same way it was originally. Also cut away fabric to allow the spar to be raised the proper amount. 5) It is impossible to access this area with a drill as was the case during original construction unless fabric is removed from the side of the fuse. I used a combination of right-angle drills, extension bits, and finally a milling bit in a Dremel tool to bring the holes to finished size. 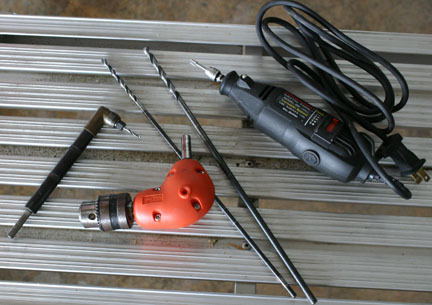 A compact right angle drill attachment with a 3/32" bit was used to make pilot holes and check alignment. Then the pilot holes were enlarged to 5/16" using the other tools. It is a very tight location and requires physical flexibility, stamina and abundant patience. But it can be done if clear access to the area is available. 6) Test fit of the carry through in the new location and rechecked incidence with the level and 1/4" shim. Target is 0.0* but if the desired incidence was slightly missed, it is what it is. Notation of this new value must be retained so it can be transferred to the upper spars. 7) There were two sets of empty 5/16" holes where the carry through was originally located. I inserted 5/16" all-thread rod in those holes with flat washers, lock washers and nuts on both sides of each tube in order to add rigidity to the structure. 8) Completed final assembly of the relocated carry through and verified correct spacing by fitting each wing panel on the tubes. Shimed as necessary to lock in the proper spar-to-spar dimension. Don't forget to reinstall the lift tangs! 9) Applied a fabric patch over the gap left when the spar was raised. If latex paint finish was used, Stewart (3M) adhesive sticks aggressively to the paint, no need to strip the finish. The wing root fairings needed modification where they attach to the fuse side panels. 10) Rechecked level of the entire fuselage to assure it wasn't disturbed. 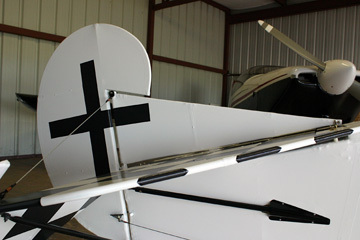 The cabanes are modified by replacing the aft tubes with longer ones so the rear spar can be raised to achieve 0.0* incidence. While in concept the wing merely rotates around the front spar, I found it necessary to remove the center section and cabanes due to interference between the front spar and forward edge of the forward strut. The Dremel milling bit was used to radius the end of the tube to accommodate the front spar as it rotated forward. Note: Match-drilling new cabane gussets to the existing holes in the compression struts would be extremely difficult (impossible? )with fabric in place. I used the original gussets to avoid this complication and riveted them to the new, longer aft tubes. Note: A fixture is needed to hold the center section at the correct incidence while the cabanes are rebuilt. I clamped 2x2's to the fuse longerons and attached a cross piece to maintain the desired angle. This photo shows the fixture holding the center section during initial dis-assembly. 1) While the cabanes were off the fuse I drilled out the rivets attaching the aft tube. The head of each rivet is drilled off with a 3/16" bit then a pin punch used to remove the body of the rivet without damaging the holes. Enough 3/16" clecoes were inserted to put the cabane back together and the cabanes and center section were refitted to the fuselage with the rear cabane compression bolts removed. 2) The level was used to raise the rear spar to 0.0* incidence with the 1/4" shim between the level and rear spar. An extra set of hands is needed. The gap on both sides between the bolt hole in the cabane and the hole in the compression tube was measured to determine how much longer the new aft strut tubes need to be compared to the old ones. The center section was lowered and clecoes reinserted in one aft tube. 3) The clecoes from the upper gussets in the other tube were removed but the pair of gussets were left hanging from the bolt in the compression tube. 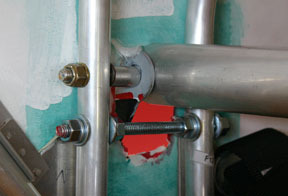 4) Fabricated the new aft tube by adding the gap measurement to the original tube length using the original tube as a template for trimming the ends. 5) Inserted the new tube into the cabane and marked where new rivet holes needed to be drilled. Drilled only those holes that could be easily accessed, the others were match-drilled in place in the next step. Inserted clecoes into the new holes. 6) Removed the cabane from the plane and finished drilling holes. Riveted the new tube to the gussets. 7) Repeated this procedure for the other cabane. 9) Tighten everything securely because the center section will be used to set incidence of the upper wing panels. While it was necessary to only replace the aft tube in each cabane, the only component in the N-struts that can be left untouched is the forward tube. Both center and aft tubes must be replaced with longer ones. 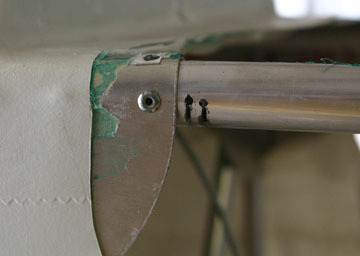 However, the aft tube is long enough to be moved to the center position, cut to length, and redrilled to the gussets. New material is needed for the aft tubes. Great care must be exercised in establishing correct incidence of bottom and top panels simultaneously just as in original construction. But re-rigging is once again complicated by working with covered wings. During initial construction a level could be laid over the naked compression struts and spars. But neither component is now accessible. The spar stubs at the fuse and center section are now properly located, but I needed a process to set the wing tips. My method is detailed below. 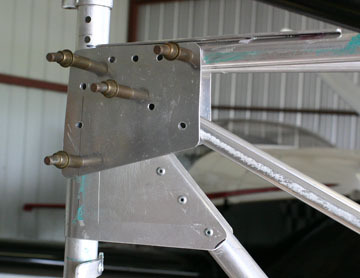 A fixture is required to hold the top wing rigidly to the correct angle. I used a combination of 2x4's and 1x2's to construct and brace the fixture. Clamps held the cross pieces during initial adjustment then drywall screws secured everything during rigging. Both top main spars must be level span-wise. 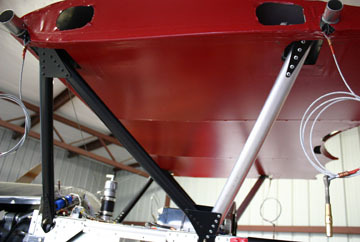 The distance between front spars is already set by the existing forward N-strut tube which is reused. By the way, foam 'pool noodles' make great padding for wing panels when they are off the plane. Note: Wing incidence was already established by relocating the bottom rear spar carry through and the top center section rear spar. The task is to hold this same angle all the way to the wing tips. 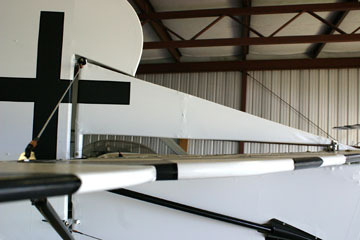 Measuring specific angle is not necessary, but rather comparative measurements across the span of the wing panels will insure proper incidence. Note: I located wood blocks of the same size exactly 12" from the trailing edge of each wing panel at the wing roots and last rib bay. One end of the digital level was placed on each block, the other end on the leading edge sheeting. I took the first measurement at the wing root, then transferred the same angle to the wood block station near the wing tip. 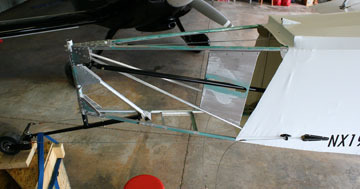 By adjusting the landing wires the bottom wing could be brought into proper incidence. The same process was used on the top panels to establish proper incidence prior to cutting the new N-strut tubes to length. 1) Removed an N-strut and drilled out all rivets except the ones securing the forward tube. 2) Reattached the forward tube/gussets to the main spars and the top aft gussets to the top rear spar. 3) Established the dimension for the center tube and cut the original aft tube to fit the center position. 4) Put the 'new' center tube in place and match-drilled four holes through each gusset (using the existing gusset holes) into the center tube and inserted 3/16" clecoes. 5) Determined the dimension for the new aft tube and cut and trim it to fit. 6) Put the aft tube in position and match-drilled as many holes as possible and inserted clecoes. 7) Once all tubes were securely clecoed and wing angles rechecked and confirmed, I riveted the accessible holes then removed the N-struts from the wings. The rivets held the N-strut in alignment. 8) Match-drilled the remaining holes and pulled rivets. 9) Installed the new N-strut and attached to the compression struts with AN hardware. 10) Rebuilt the other N-strut in the same manner. Unfortunately, flight tests following re-rigging of the wings revealed N1918Q was still severely out of pitch trim. It was obvious further adjustments were needed to increase the relative incidence between the wings and horizontal stabilizer. The practical limit of raising the stab on spacers only yielded +1.5* and flight tests indicated at least twice this angle was needed. Because there was no realistic means of raising the leading edge of the stab this much, I decided to modify the aft portion of the fuselage to accommodate the stab at +3.0*. This step was not taken lightly because fabric had to be removed from the tail of the fuse. The plan was to drop the aft attachment of the top longerons at the tailpost 2.25" which would take them from level to 3.0*. Once again the plane was carefully leveled in all directions. It might be possible to remove less fabric than shown but at the time I wasn't sure how exposed the structure needed to be for the mod. 1) Removeed tail surfaces and fabric to expose the aft fuse and also removed the elevator pushrod. 2) Used the level to determine how much the rear longeron attachment needed to drop to put the longerons at 3.0* and marked the tailpost at this position. 3) Drilledout rivets on the gussets holding the top longerons to the tailpost. Left the gusset on top of the longerons in place. This maintained the basic integrity of the aft fuse. Note: The top longerons must 'bend' at the fuse station at the rear of the turtledeck. I considered cutting them but decided that would be the last resort. They were too stiff to bend in place so I used the following technique to induce flexibility. 4) Drilled two 3/32" holes in each side of each longeron as shown. I used a thin cutoff wheel in a Dremel tool to make cuts halfway through each tube terminating at the holes. The holes will prevent cracks from propagating from the cuts. 5) Bent the longerons until the gusset on top of them at the tailpost aligned with the mark made earlier indicating 3.0* slope. Clamped the longerons at the tailpost to secure them at 3.0*. 6) Fabricated 0.025" gussets to cover the area of the longerons that was cut and bent. 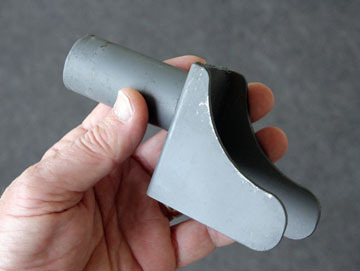 The gussets can be hammer-formed in place to make them fit snuggly around the longerons. Riveted the gussets in place. 7) Using the original gussets as patterns, match-drilled new 0.090" gussets to the top longerons and clecoed in place. The shape of the new gussets are slightly different to account for the 3.0* slope of the longerons. 8) Drilled new holes through the gussets and tailpost. 9) The small diagonal tubes were bent slightly at their root after they are shortened to fit into the gussets. 10) Trial fit the horizontal stab on the relocated longerons with the original spacers. The existing mounting holes still fit because their location hasn't changed. Verified the stab was located at +3.0* relative to the top longerons at the cockpit. Riveted the new gussets with 3/16" rivets. Note: It is interesting to observe that this configuration of the horiz stab appears to match the incidence in drawings of the original D.VII. Perhaps Fokker had this incidence thing figured out in 1918? This configuration also allows the horiz stab to follow the lines of the top stringer of the turtle deck like the original D.VII. Very nice. 11) Moved the elevator pushrod exit. 12) The horiz stab brace tubes needed to be shortened because the trailing edge of the stab was lowered. 13) Fabricated new vertical stab brace cables because the original cables were too short. Because the stab has been reset to an incidence of +3.0*, the vertical fin no longer fits as it should. The large gap between the stab and fin renders the fin practically useless for adding yaw stability to the D.VII. The best remedy is to build a new fin which extends all the way to the horiz stab. This should be done after flight tests have confirmed the incidence of the stab results in trim performance that is desired and the stab requires no further adjustment. Any Airdrome Aeroplane D.VII built carefully to the original plans will need to be modified in order to remove the aggressive climb trim problem. Each aircraft is slightly different and the solution may vary depending on how the particular aircraft was constructed and rigged. But the plane needs approximately 3.0* incidence difference between wings and horizontal stab. 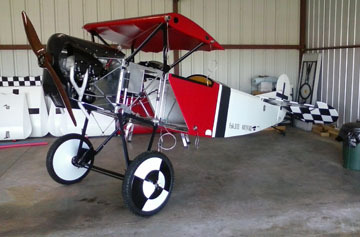 Some builders may be able to achieve this configuration by modifying just the wing rigging or the rear fuse, but some aircraft will require both mods. Fortunately, correct incidence will yield a D.VII with pleasant flying characteristics.